You've got to check this out! My good friend Kurt from Other People Exist shared this revolutionary product offering to me. You can check out details here. I think Kurt knew my fondness for subterranean anything. After all, I am the guy proposing underground roadways from my home to strategic destinations across the city so I can avoid all traffic. I did mention that time I built 17 sub-basements. Oh yes, this idea is a winner! It’s so much a winner in-fact that I’m going to give them more VE ideas on the theme…for free! Imagine all the uses for this concept? They’re endless! Are there too many women clogging the bathroom at home? Open the door up to the emergency man’s toilet from the hallway outside the main bath. You’ll never have to pound on the door screaming “Aren’t you done yet?” again! Are the in-laws coming over for an extended stay? Put them in the in-law room. Simply open the door from the utility room floor and there…they’ve got a place to stay in the home where you’d never go. You won’t hear them and you’ll rarely see them! Is the wife not letting you out for poker night but she still falls asleep by 9pm? No problem. The special “other exit” via the furnace room sub-floor (because let’s face it, they’ll never go in there) is your answer. Stay out half the night and then blame work and family stress for your stupor the next day. Screaming kids? Put them down in the special sub-basement room with sealed sound proofing and a door that only opens from the house side. Camera and intercom are provided so you can look like a concerned responsible parent. I am commenting on the little photo in your right side bar...the photo of the toilet with all the rolls of toilet paper. Of course it's a WOMAN'S bathroom because only a woman would put the toilet seat DOWN!!!!! I am mesmerized by all that wine!!! VE I think this is an excellent idea. I mean I could hide all my shoes down there and my husband would never suspect that I have 427 pairs of black shoes. If he didn't see all the boxes he would think they were all the same pair. an in-law room! i would LOVE to banish mine to the basement! That is awesome. I'd probably use mine to cover up my grow-op. That, or as a place to hide my Barbie collection. I never have a problem with women clogging up the bathroom. That's what backyards are for, dood. The idea of private underground roadways that you mentioned is the best idea ever. No traffic lights. No stop signs. And, best of all, no idiotic drivers to deal with. I love it. Now that's what I'm talkin' about!!!! Okay, I was skeptical until the last possibility: put the screaming kids in there. Oooh, I'd fill it full of Girl Scout cookies!! I agree with Quirky; stick the kids down there until they stop screaming. Hopefully by the time they're 18, you can let them out. If you move before then, be sure to let the new homeowners know about them. You lost me at mementos that can't be thrown away. Uh oh. Just kidding. I love the idea. In fact, we call them tornado shelters. Mine is full of dead bodies. I wasn't entirely sold until the screaming kids part. Speaking of afraid, I can't get "Menopause Barbie" out of my head. Thanks a lot. I think its easier to just have your own escape room... a barricaded one with a big screen tv and a keg. I'm building one of those. I could eat cheeseburgers and smoke my cigarettes without fear of the meddling health police and ninnies interfering with my pleasures. Cheers VE!! By the way, installation is free, and the units start at just $85,000. We opted for the stainless steel version ($115,000), and it was worth every penny. jaime - Best place for inlaws...EVER! freetheunicorns - I knew you had a barbie collection...I KNEW it! dalton - I always thought that would be just awesome! megan - Wine and storage...what more does one need! jacki - They gotta go somewhere! beth - Actually I'm equally fascinated by attics too. You just cannot be as stealthy with them though. The government doesn't have 12 upper attics hidden in the white house. I've often wondered at what height somebody owns property too. What if you tether a floating house right above some neighborhood...could you legally stay? 3 out of 4 kidnapping sexual deviants approve! did you ever see the movie "blast from the past?" yeah, i can totally see you as christopher walken in that flick. lime - I've never heard of that movie. I'll have to go see what you're talking about... Christopher Walken...you never know what he's up to either. I can see this being a problem in California. I mean, after a few years the basement is underneath your neighbor's house and you have to start all over. more places for mice to live. roy - Hey, the subterranean frontier is a first come, first serve model. If the neighbor snoozes...he loses! My husband is always complaining about his lack of a "man cave" - must send him this post. I can't tell from the pictures, but do those stairs go down forever, or do they end at some point? If they're not endless stairs, I think I'll pass. I was thinking of keeping my giant shoestring collection on those shelves, but now it looks like there won't be enough space. Awesome. Very cool. I want a dozen. I think John Wayne Gacy started this fad. Angrymax - I've never owned shoestrings from a giant personally but I believe they can auger that hole down at deep as you need it for your collection! What a great idea. 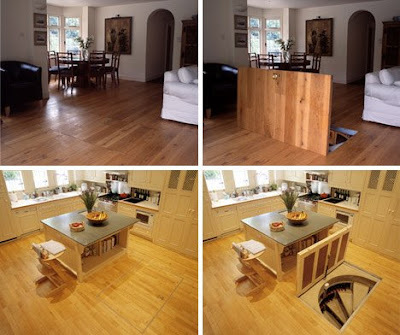 Creeps and deviants notwithstanding, every home should come equipped with at least a couple of cool hidey-holes. Innovative thinking at its finest! Good call. I'd use mine to store my stupid kids in...Then I'd have a real life " children under the stairs". Went to that site and did you see the Bedroom in a Box. They have some interesting ideas there. 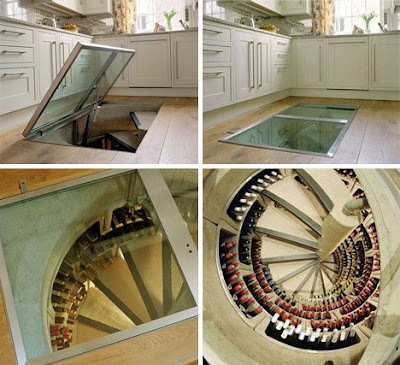 Hubby would love to have this wine cellar but being here in Southern California, I would not feel safe during an earthquake and since we have been having all these swarms of little quakes these past few weeks it would be scarey if one would be down there during an earthquake. I think that is why there are very few houses here with basements. I'm not sure if you have ever been in a quake since you travel so much, but another reason that wine cellar would not be good is that everything would fall on the door and you would not be able to get out. But those pictures were great of them. And all that wine, just think of the great party you could have. Might even make you forget about all the rain. I wish you could send us some of that rain. chris - Who wouldn't want one! dani - Then we could turn it into a reality show! I felt claustrophobic while reading this. perpetual - Don't worry, we can make yours even bigger than your actual house! i like the kid storage sub basement. dee - For some reason that seemed to be the most popular application of these. Inlaws came in second. You mean people actually put CARS in garages??? maureen - I don't even know why they still pretend that when building. They should just carpet the whole damn garage.